Hopkins' Rose, an inch-long pink sea slug common to Southern California, has been found in abundance on the Central Coast and in Northern California. Good locations to view the current bloom of Okenia rosacea in central California include rocky shore tidepools and underneath ledges at Montaña de Oro and Asilomar State Parks, Scott Creek Beach, Pigeon Point, Pillar Point and Fitzgerald Marine Reserve. Jeff Goddard advises checking local tide charts and going during a minus tide, preferably when both the swell and wind are low, and to tread lightly, wearing shoes or boots you don't mind getting wet. 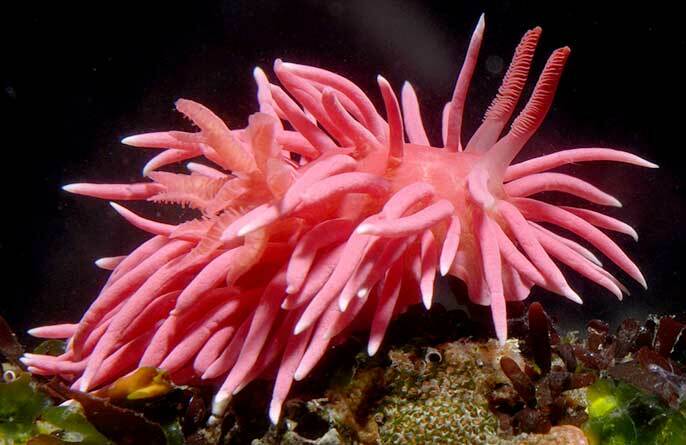 The Hopkins' Rose nudibranch (Okenia rosacea) is locally common in southern California but sporadic in central California and rare north of San Francisco. In the past few weeks, however, researchers from UC Santa Barbara, UC Santa Cruz, Bodega Marine Laboratory and the California Academy of Sciences have reported densities of up to dozens per square meter in tide pools from San Luis Obispo to Humboldt counties. These are the highest numbers and northernmost records of this species seen since the strong El Niños of 1998 and 1983. Only this year, there’s been no El Niño to speak of. Zoologist Jeff Goddard, a project scientist at UC Santa Barbara's Marine Science Institute and research associate at the California Academy of Sciences, equates the current population bloom of Hopkins’ Rose to the one he observed on the Central Coast starting in early 1977. “Last week, during routine monitoring near Morro Bay, I was astonished by the numbers of Okenia present,” Goddard said. "We haven't seen anything like it in years," said John Pearse, professor emeritus of ecology and evolutionary biology at UC Santa Cruz. "These nudibranchs are mainly southern species, and they have been all but absent for more than a decade." 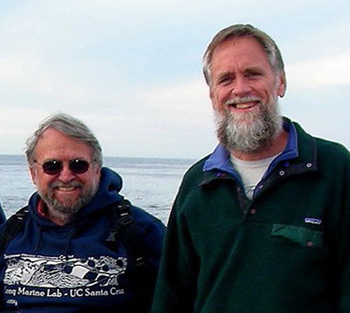 John Pearse (left), Jeff Goddard and others have been conducting surveys of nudibranchs at study sites along the California coast for decades. Pearse, Goddard and other researchers have been conducting surveys of nudibranchs at study sites along the California coast for decades. "What makes this event especially exciting for us is that in 2011 we published a paper in which we predicted that oceanographic conditions like we are now experiencing would be marked by heavy recruitment of these and other nudibranchs. It's just wonderful to see the prediction coming true," Pearse said. The research team includes Pearse's wife Vicki Pearse, a research associate at UC Santa Cruz's Institute of Marine Sciences (IMS); Terrence Gosliner, senior curator at the California Academy of Sciences; and IMS researcher Gary McDonald. Steward Shultz, the first author of the 2011 paper in Limnology and Oceanography, is at the University of Zadar, Croatia. Pearse noted that the study relied in part on data from Goddard's senior thesis research in the mid-1970s, when he worked with Pearse as a UC Santa Cruz undergraduate. "It is always pleasing to me to see our students' senior theses end up in publications," Pearse said. The 1977 bloom occurred also during a weak El Niño and coincided with a major climate shift in the eastern Pacific Ocean known as the Pacific Decadal Oscillation. That shift marked the beginning of more than two decades of coastal water temperatures that were elevated compared to the preceding 30 years, triggering range shifts in numerous coastal species, including gastropods, barnacles, fish, and dolphins. This triggered range deviations in numerous coastal species, including gastropods, barnacles, fishes and dolphins. During those warm decades, fluctuations in the abundance of intertidal adults of Hopkins’ Rose and other nudibranchs in Central California were driven by regional oceanographic influences on currents and larval recruitment. This is what Goddard, Pearse, Schultz, Gosliner and others argued in the 2011 paper. They predicted high recruitment of these nudibranchs when warm temperatures, northward-directed currents and weak upwelling occur — and that is exactly what is happening now. Like the previous population explosions of Okenia, the current bloom has also been accompanied by other sea slugs normally found farther south, including the bright purple and orange Spanish shawl (Flabellina iodinea) and the California sea hare (Aplysia californica). While southern species of fish, seabirds and marine mammals also have appeared in Northern California as adults, nudibranchs differ in being carried as microscopic planktonic larvae on the coastal currents northward and onshore. When the larvae have fed and grown large enough (typically over a month or two), they settle to the bottom and, if they encounter the prey of the adults, they metamorphose into juvenile slugs.